1. Preheat the oven to 200˚C, gas mark 6. Toss the potatoes in a tin with 1½ tbsp oil, season and roast for 45 minutes, shaking the tin a couple of times during cooking. Scatter the rosemary over, shake again and return to the oven for 5 minutes until golden and tender. Cool slightly. 2. Put the bacon in a large, cold frying pan with ½ tbsp oil. Set over a low-medium heat and cook gently for 5 minutes until turning crisp at the edges. Add the shallots to the pan and cook for 2 minutes, then stir in the garlic and cook for 1 minute more. Finish with 1 tbsp vinegar; let it bubble away to nothing, then remove the pan from the heat. Season with black pepper and scrape everything into the tin with the potatoes. 3. Stir the mustard and the remaining 1 tbsp oil and 3 tbsp vinegar into the bacon mixture; season. 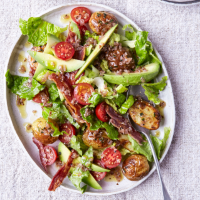 Slice the avocados and toss with the lemon juice to prevent browning, then gently tumble through the potatoes, tomatoes and lettuce. Transfer to a serving plate and serve immediately.